However, all this flexibility has its downsides too. It means your “office” may be a couch with your laptop laying on your thighs, the back seat of an uber, or any free seat at the nearest coffeeshop. Even if you aren’t sitting in an office as much, you may be working more, since all you have to do is glance down at your phone to reply to texts and emails instantly. Which leads to my next question, how is your neck feeling? If you answer is “not great,” you aren’t alone. As an acupuncturist, I see a lot of patients with a variety of main complaints but one area where there isn’t a lot of variety is in the neck. Almost everyone has an irritated neck. Patients feel discomfort and aching, they feel pops and cracks in the spine, they experience head forward posture and notice knots/muscle spasms in the traps. The neck is a common storage place for mental/emotional stress but we are adding a great deal of physical stress too. All of these activities require us to look down and forward, sometimes for long periods. Who hasn’t found a rabbit hole online? This position strain can have real consequences. At Jade, we can examine this issue from the perspective of acupuncture, physical therapy and yoga. All of which can be helpful at battling back and getting rid of your neck tension. In terms of acupuncture, any kind of pain is considered stagnation, or blockage, in free flow of blood and energy through the body. Solving the pain is about unblocking the stagnation and keeping it unblocked. To do that, we insert small needles into the area affected, unblocking the channels and promoting relaxation of muscles, improved blood flow, and reduction of inflammation, all easing the pain. Have set times to check email and check your phone rather than compulsively sneaking a peak. Retrain your muscles. For tight traps, I recommend using a warm neck roll at night to remind your muscles to relax. Take the time to stretch. Create places in your home to work from that have good ergonomic set-ups. Get physical therapy and acupuncture tune-ups to keep your neck in good shape. Checking in with your posture throughout the day is one of the most important things you can do to prevent neck pain and cervicogenic headaches (headaches caused by neck tension and malalignment). 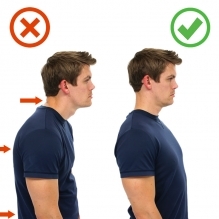 Alignment: Begin by aligning your ears over your shoulders (drawing the chin slightly down and back), then align your shoulders over your hips, squeezing your shoulder blades down and back (see photo with green check mark above). Setting a timer to go off once per hour during the workday is a helpful way to remind yourself to get up, stretch and rejuvenate, and begin to work again with proper postural alignment. Self Massage: To soothe sore, tired neck muscles you can perform self-massage by placing two tennis balls into a sock and tying the sock off with a rubber band (so the two tennis balls stay close together). The two tennis balls can then be used to massage your neck by placing them at the base of your skull and performing tiny “yes” and “no” motions with your head (best if done while lying down on a firm surface). You can also massage the muscles between your shoulder blades by pinning the tennis balls against a wall and rolling against them. Meditation: You can build your awareness of how you’re holding stress/tension within your body by practicing progressive relaxation meditation. Many guided meditation videos are available on YouTube which will guide you through this type of body-scan meditation. With practice, you will become more adept at realizing when your shoulders have become earrings throughout the day, and you will be able to correct your posture accordingly. Implementing regular massage therapy into your self-care routine is a wonderful way to decompress from the stresses of life and maintain healthy, functional muscle length and alignment. In yoga we approach issues such as neck tension from several angles. We look at current stress levels in the patient's life, ways the individual patient copes with increased stress and tension as well as the physical ailments that are present. Through pranayama (breath work), meditation and asana (physical poses), we are able to develop an individualized yoga program that works in harmony with our patient's physical therapy and acupuncture plans of care to release tension and heal quicker. Becoming mindful of how you hold your body throughout the day. Lengthen through the spine and release the shoulders back whenever possible. Use your core to stabilize your low back and bring your spine into alignment. Incorporate neck and shoulder releasing poses such as eagle arms, standing forward fold, extended puppy pose and easy seated twist throughout your day. Remember to breathe. Deepening your breath will help release tense muscles. Take 10 minutes each day to close your eyes and take a step back from any and all obligations. You can use a meditation app like Head Space, put on some ambient music or simply sit in silence. Take a moment and read our Intro to Meditation - Part 1 by our acupuncturist, Cleo Wolfe, if you are new to meditation.